If you follow Pinterest (and who doesn't????) I am sure you will recognize this project. According to the pin, copper pennies repel slugs. I am set to put it to the test. My flower gardening is limited but last year and the year before it was non-existant because slugs devoured everything. This year I am being proactive. Here is our new garden sculpture. My daughter, Amy is an avid tag saler and I asked her to keep hers eyes open for a bowling ball. Didn't take her long before she had 3 at $1 a piece. 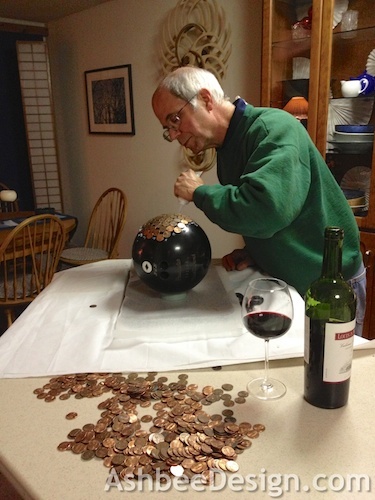 Last Friday David and I had a date to glue pennies onto that ball. He was in charge of applying the glue and I applied pennies. Note the wine. As I said, it was a date! I wasn't sure what to use for glue so I tried Liquid Nails which is thick and goopy. Seemed to work fine. It took less than 1 2.5 oz tube but strong hands to apply. I forgot to count but I estimate it took about $3 worth of pennies. 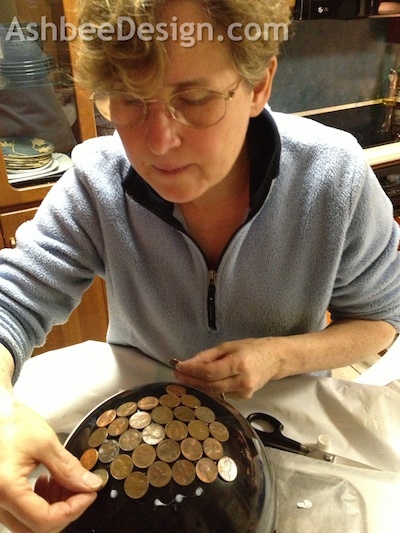 I also made sure that many of them were from before 1982 when they switched the copper content of pennies to almost none. We left it to dry over night and put it in the garden the next day. Today is Wednesday and I haven't seen a slug yet but that really isn't a very good test period. Aside from the gardening impact, the ball looks pretty cool. And, if you've been following me for long, you'll know I have a things for spheres! Get your hubby on board! It was a fun evening, something totally different for a change..... pun intended! So ... three years later ... are your slugs still staying away? Very cool piece. It has lessen the number of slugs but it has not gotten rid of them. Still it is neat piece in the garden. So I assume it's the copper leaching into the ground that disturbs the slugs (I'm thinking). I wonder if their is any problem with using it in a vegetable bed that might soak up higher copper content? May not be bad considering our drinking water typically runs through copper pipes. I do use copper in my tropical fish aquariums and pond to kill parasites and sounds like slugs may be disturbed by this also in theory? I also know most weed killers are 99% copper solution. This project sounds a lot like the swinging CD's on fruit trees to keep the birds away (may or may not work)? Hmmmmm, there's more than a few things to ponder here. Thanks for the decorative idea eitherway. 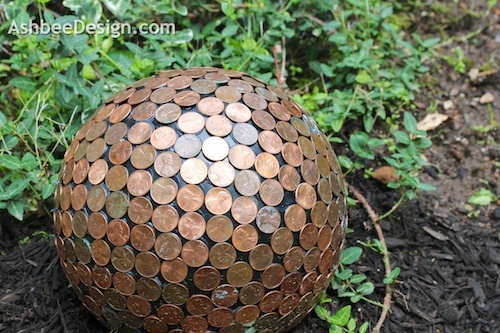 Okay, I already have a followup consideration here that isn't helpful if what you want is a large copper ball in their garden but there are many copper made figurines that are made for gardens and maybe one benefit few have thought of and seeing that collecting pre-1981 pennies are very hard these days (I make coin rings as a hobby and have to buy all my pure coppers through ebay which is actually around $5 for a 50c cent roll each) it may make good sense to buy copper tube piping and run it along the entire perimeter of your garden bed. In fact, utilize it as a water line and drill out some holes to water the garden while you are at it and I'd have to say if the copper pennies have any affect on keeping slugs out, an entire perimeter of copper tubing and disbursment of water via the tubing "should" work better? Just something new to consider?